Through the use of a deed or will in writing, a grantor may create or dispose of any interest in or claim to real estate in the District of Columbia, whether it is for present or future possession and enjoyment, and whether it is vested or contingent ( 42-301). The District of Columbia Code, 42-601, provides statutory forms for conveyances of real property, which are sufficient for their respective purposes. Any covenant, restriction, limitation, or provision allowed by law can be added, attached to, or introduced in the forms provided. Other forms conforming to the statutory rules will be sufficient for a conveyance of real property in the District. A grant deed contains some of the usual covenants of title, but does not offer as much protection as a warranty deed. In a grant deed, the grantor warrants that he has not previously conveyed the estate being granted, has not encumbered the property except as may be stated in the deed, and will convey after-acquired title, unless the deed states otherwise. 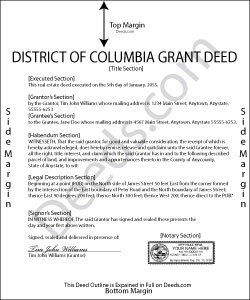 Upon presenting a grant deed to the Recorder of Deeds for recordation, the grantor must sign the deed and have his or her signature acknowledged by an officer who is authorized to perform notarial acts in the District of Columbia. The following persons can perform notarial acts in the District: a notary public of the District; a judge, clerk, or deputy clerk of any court of the District; or any other person authorized to perform a notarial act in the District ( 42-143). Notary acts performed in another state by a person authorized to do so will have the same effect under the laws of D.C. ( 42-144). According to the D.C. statutes, a "notarial act" is defined as taking an acknowledgement, administering an oath or affirmation, taking verification upon oath or administration, witnessing or attesting a signature, or any other similar act authorized by law ( 42-141). Notarial acts should be evidenced by a certificate that has been signed and dated by the notarial officer performing the act ( 42-147). A grant deed conveying real property or interest therein in the District that is executed and acknowledged and certified as provided, and delivered to the person in whose favor the deed is executed, will be held to take effect from the date the deed was delivered. However, as to creditors and subsequent bona fide purchasers and mortgagees without notice of the deed, and others interested in said property, the grant deed will only take effect from the time of its delivery to the Recorder of Deeds for recordation ( 42-401). When two or more deeds pertaining to the same property are made to bona fide purchasers for value without notice, the deed or deeds that are first recorded according to law will be given priority ( 42-406).